I like trains. 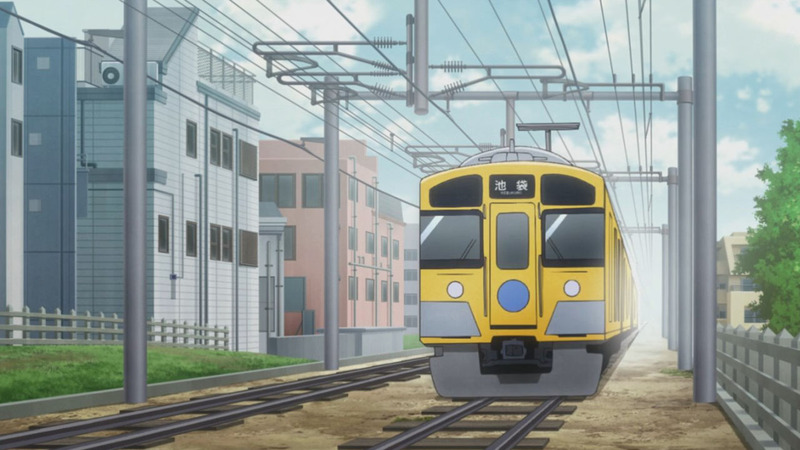 This is convenient for me as an anime blogger because Japan also likes trains. I don’t hold a candle to their dedicated hobbyists, train spotters who will follow new models around and buy tickets without destinations just for the sake of the train trip. Even outside of the maniacs, trains are a constant of life for those living in metropolitan Japan. The public transport system in large cities are very developed, and in the heart of Tokyo you can go almost anywhere by mass transit. 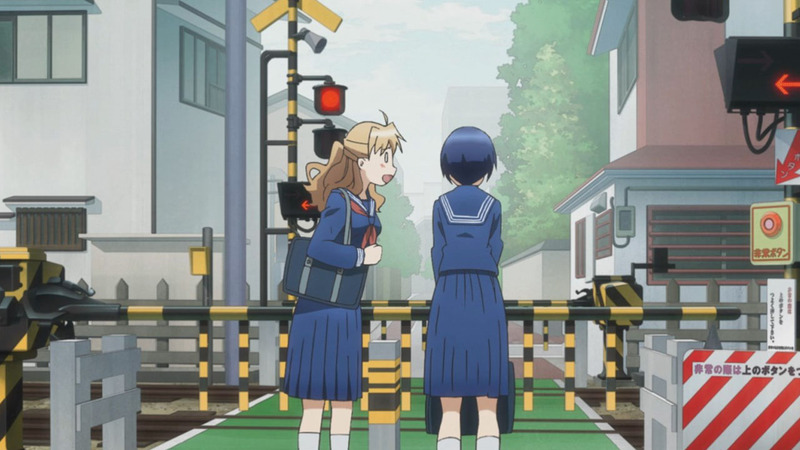 For those on foot, rail crossings are common, so perhaps it’s not surprising to have an anime about people waiting around for trains to pass. 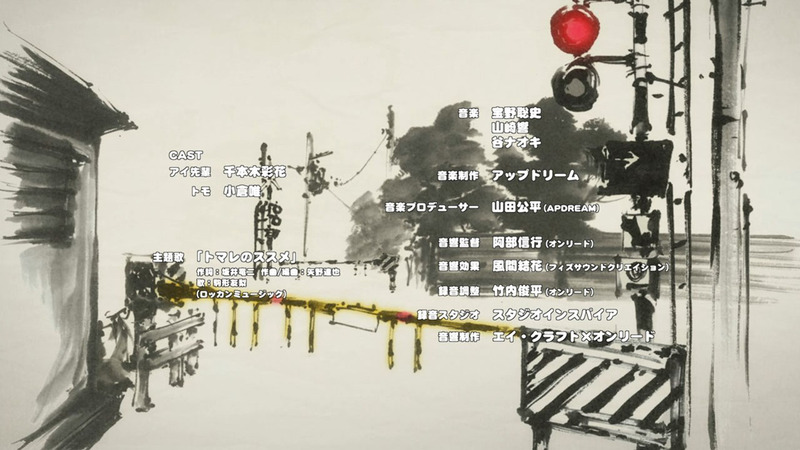 They’re already easy symbolism for shows set in urban Japan, so it’s not too much of a stretch to create a slice-of-life around the idea. 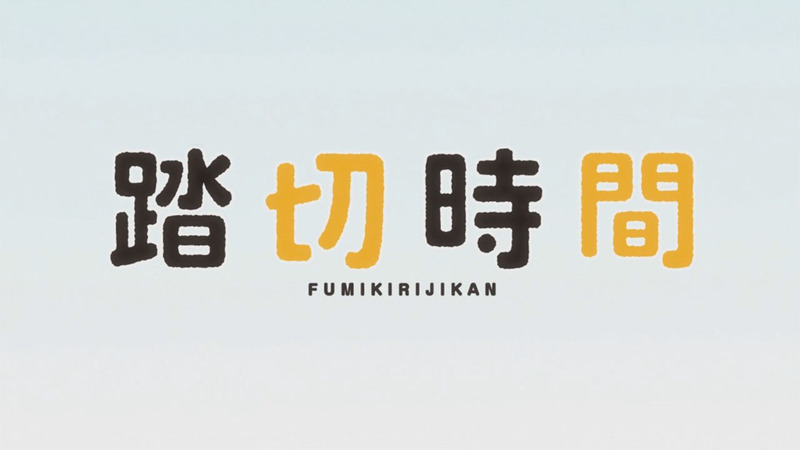 At first, I wasn’t sure what to make of Fumikiri Jikan. I went into it with the vain hope that it would be absurdist theatre on the level of Waiting for Godot, where a pair of high school girls talk about seizing the moment yet spend all their time waiting for a train that never comes. 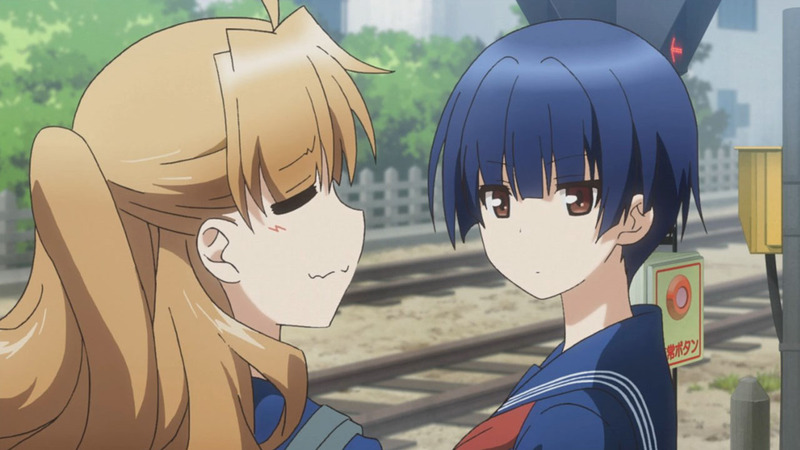 Then I thought it’d just be self-contained Lucky Star-esque skits that combine slice-of-life with observational humour. 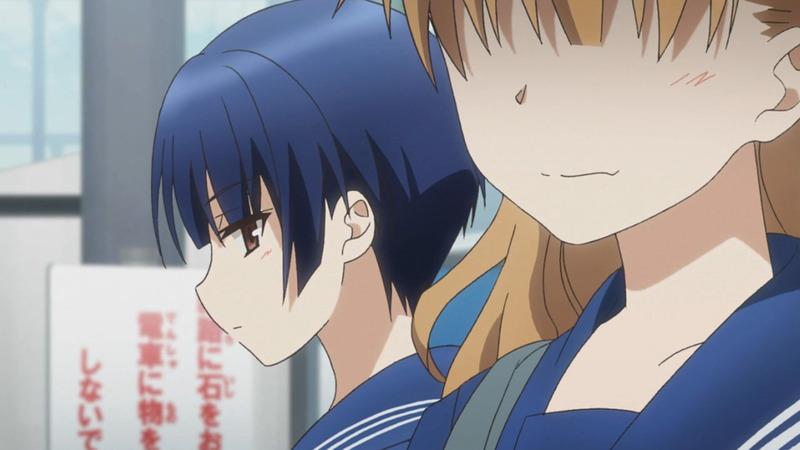 But actually, Fumikiri Jikan is not so different from any other anime, just condensed. Yes, it’s a short. Yes, there’s only one set. Yes, it’s only three minutes. But in those three minutes Fumikiri Jikan more or less canvasses a complete arc of a typical romance. 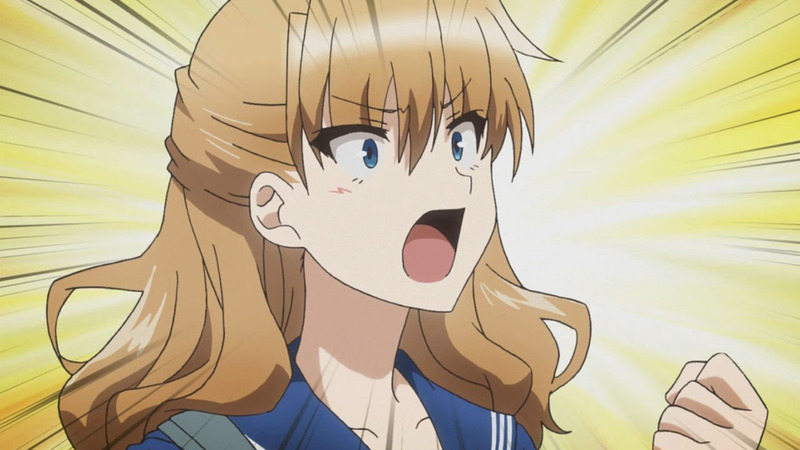 Establish characters: loud senpai, reserved kouhai => Build chemistry => Hint interest => Surprise confession => Much blushing => Kouhai turns tables on senpai. And scene. Isn’t that an anime in a nutshell? 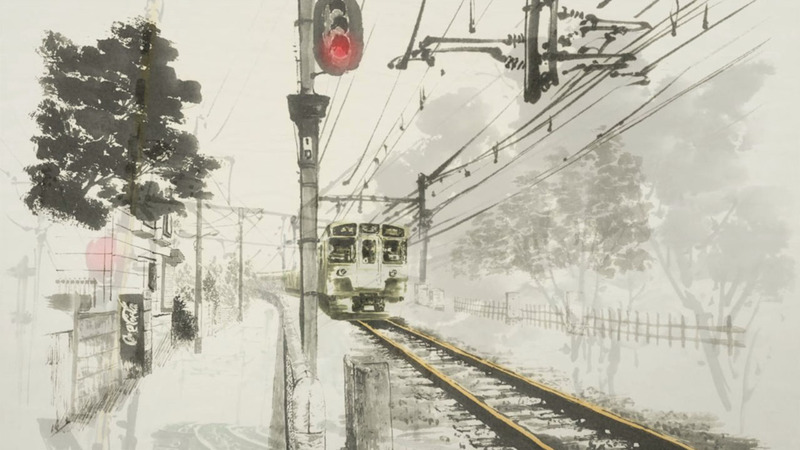 I have no idea if Fumikiri Jikan‘s future sketches will be anything like this one, but the three minutes we got in this pilot made for an oddly satisfying experience. And that’s how shorts should be, no? If you don’t have time for a regular anime watching schedule, then maybe the compressed version is for you. Sure, it’s just a bite, but there may be enough flavour there to sate your appetite. How long is this per episode? Uh oh, the boss reads my stuff. Danger. Well, that was a pleasant surprise – small but perfectly formed. And despite everything they managed to cram in, it didn’t seem rushed. Maybe that’s because time goes more slowly when you’re stuck waiting for a train to pass! I wonder, will the same story will continue next week? I expect that it’d be a different sketch every week, making use of the seiyuu cast already lined up, but your guess is as good as mine. If there are more characters then I hope they’ll at least come back to Tomo and Ai later on in the series. I hope they don’t have a different pair *every* week. Tsurezure Children was fun but it suffered from having a couple too many couples, so to speak. 100% agree. Snappy and well-timed with no filler. 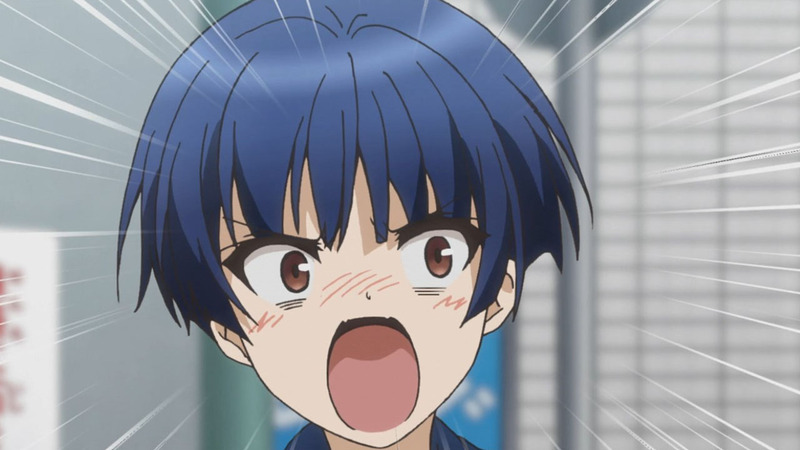 I must admit I was (positively) surprised when senpai’s line about romance not being possible without a boy was suddenly challenged and discussed, instead of being considered an understatement or swept under the rug. 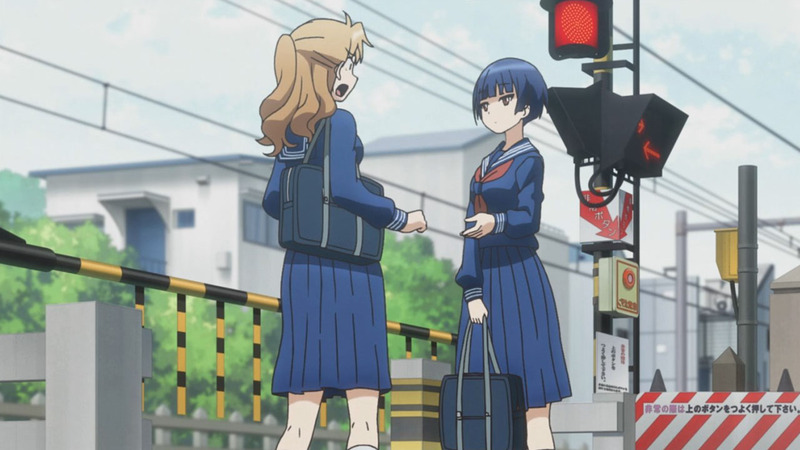 Didn’t realize this short was taking the yuri route until that moment. Still not sure about what this series will be about, though. And no, reading the Season Preview didn’t solve my confusion either. I like the “vignette” description from the preview. 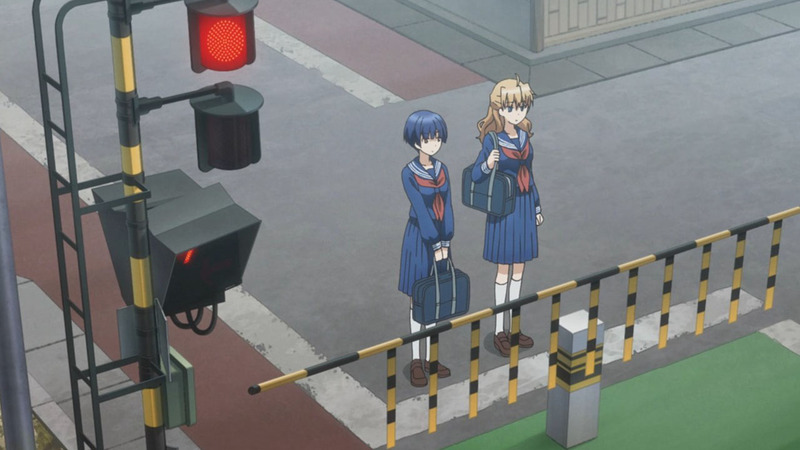 The train crossing is the focal point and makes the characters stop long enough so we get a different story each week. Or at least a piece of one. And as has been said, if the first episode is any indication, FJ is doing a better job in 3 minutes than some shows can do with 20 minutes. In for the season. Reminds me of Danshi Koukousei no Nichijou and Nichijou (not as wacky as this one though). If they pack the short skits to the normal episode length. Your line prompt me to go watch this show.